German-based manufacturer Storz & Bickel developed the very first “forced-air” vaporizer back in the early 2000’s with the iconic Volcano Vaporizer, which has been turning heads and blowing minds ever since. When Volcano pioneered its visionary balloon-bag delivery method, there were many imitators trying to top what Storz & Bickel created. However, none of them could match the quality and performance employed by the Volcano. German-based manufacturer Storz & Bickel developed the very first “forced-air” vaporizer back in the early 2000’s with the iconic Volcano Vaporizer, which has been turning heads and blowing minds ever since. When Volcano pioneered its visionary balloon-bag delivery method, there were many imitators trying to top what Storz & Bickel created. However, none of them could match the quality and performance employed by the Volcano.To further solidify their place in the Vaporizer world, Storz & Bickel went the distance and created a Digital Volcano Vaporizer, which brings the added convenience of digital temperature control. HOW DOES THE VOLCANO WORK? 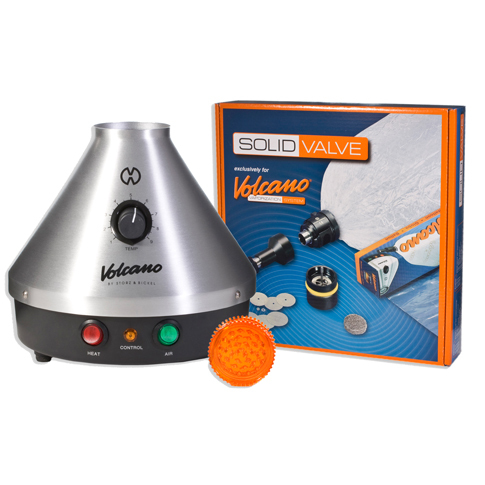 The Volcano Vaporizer delivers true vaporization in a high-powered, reliable convection heating method. With the Volcano Vaporizer, you’re only getting the active ingredients in a flavorful vapor, with no smoke or carbon monoxide. 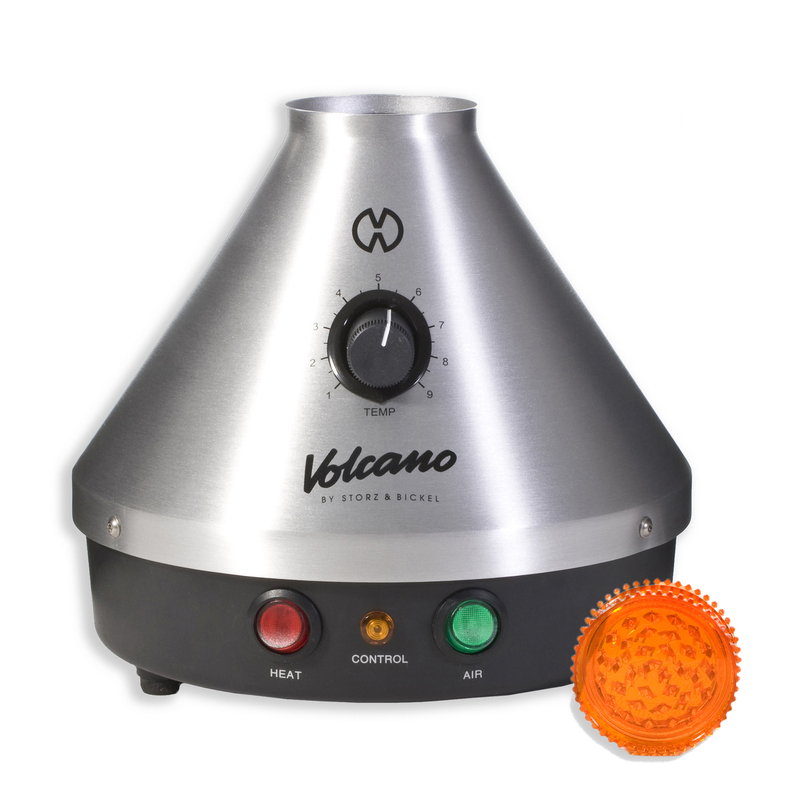 The ceramic heating block is regulated by the analog dial on the front of the Volcano, so all you need to do is turn on the Volcano Vaporizer using the red button and you’ll see an orange light on the middle illuminate (telling you the Volcano is heating up). 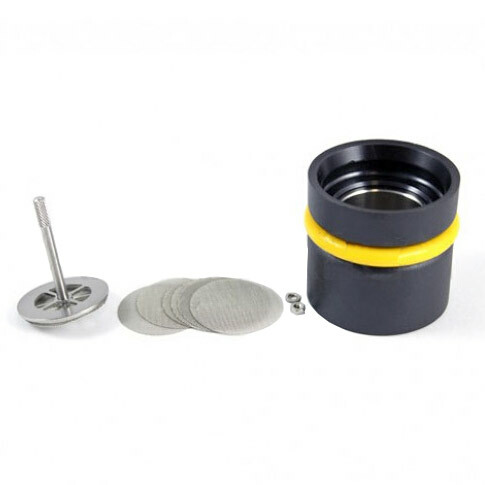 While you’re waiting, simply grind up your material and place them in the Solid or Easy Valve chamber (explained below). Once the orange light goes off, you’ll know you’ve reached your selected temperature. At this point, set the valve chamber on top of the Volcano and flick the green button to turn on the central diaphragm pump which forces hot air through the valve chamber..Within 1.5 seconds you should see a stream of vapor coming out of the top of the valve, at which point you should apply the balloon for inflation. Make sure you don’t leave the room, because the Volcano Vaporizer inflates bags in less than 30 seconds and if you leave the fan running with a full bag attached, it can damage the internal components. 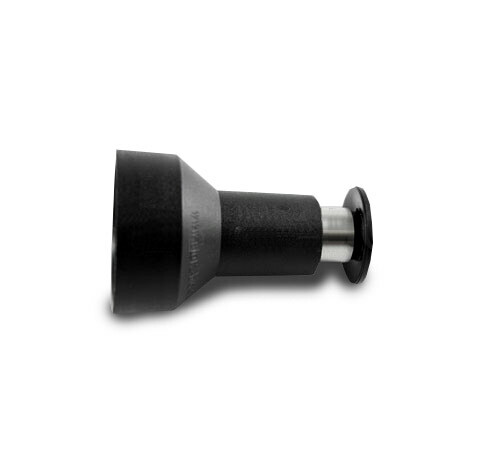 The Solid Valve is the original valve set that was conceived for the Volcano Vaporizer. 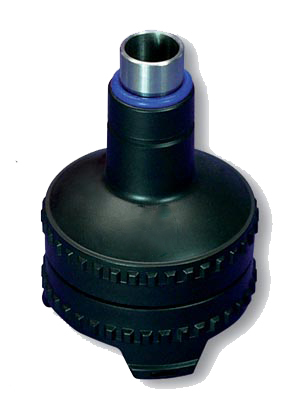 With this valve system, the user manually creates and attaches the balloon bag. This method is preferred by experienced vapor aficionados, thanks to its flexibility and customization options (you can create any size balloon). 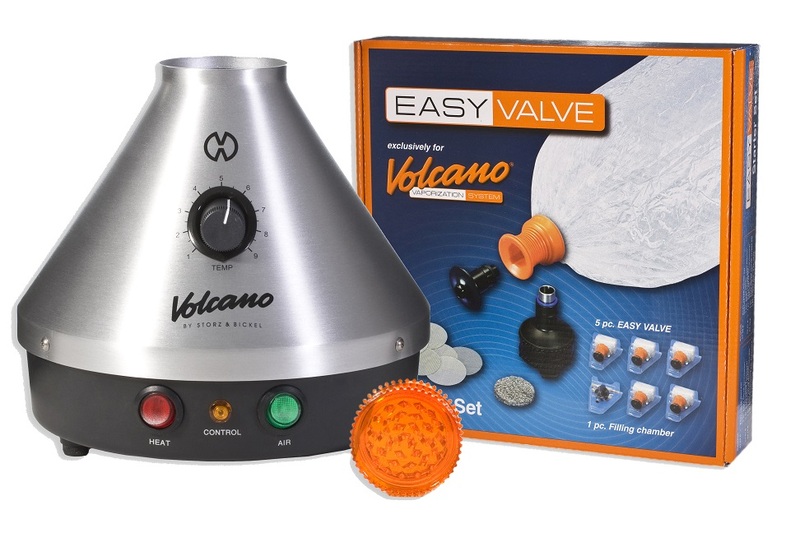 The Easy Valve was developed to help introduce novice users to the benefits of the Volcano. Unlike the Solid Valve, the Easy Valve system comes with every bag pre-assembled with the mouthpiece so that there’s no assembly required. 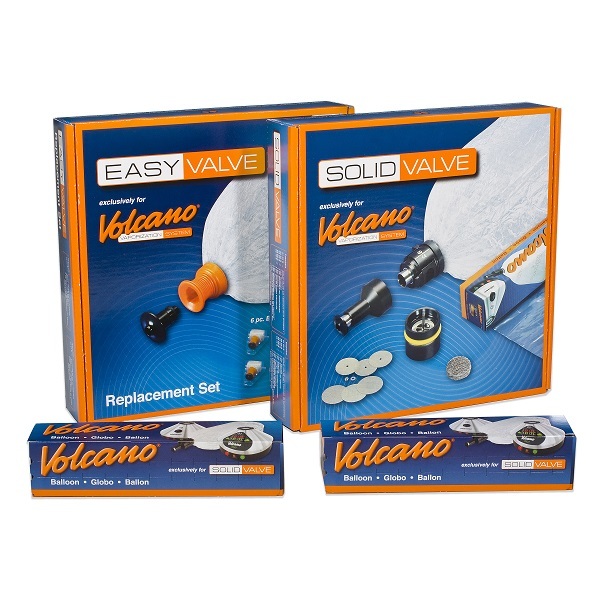 Simply place your Easy Valve bag on the Volcano and fill away! The Volcano Vaporizer measures about 8 inches high and weighs roughly 3 pounds. The Volcano Classic was designed with both function and form in mind. 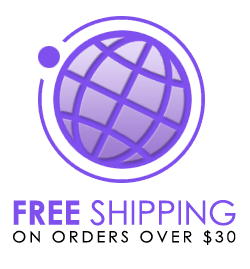 It’s made to resemble the geographical phenomenon that bears its name. The bags are very high quality and made from durable, food-grade plastic. Each balloon bag is designed to give you about two months of daily use. After this time you may begin to notice a slight stale aroma, so every Valve Set comes with 6 replacement balloons, so you should be covered for at least a year of Volcano usage from the get-go. At the end of the day, the Volcano is unanimously considered one of the best-looking vaporizers ever designed. 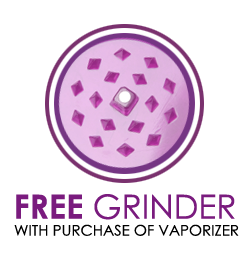 "The best vaping experience ever"
"This is by far one of the best vaporizer that I've ever used. I love the balloon feature as I am able to vape by myself or pass it around to several different people. I've never experienced the quality of vapor that the Volcano has to offer. I've had it for almost a year now and it's still running great and have not had any sort of problem. It is def worth the money. " "I bought this vaporizer recently. The first time I had used it was at a friend's house. It was actually my first time using a desktop balloon vaporizer. I tried other vaporizers along the way an none compare to volcano's quality and performance. I'm really happy with this product..."
"This is the best desktop vaporizer in the market and there isn't anything like it. I bought mine a while back and it is probably one of the best investments I've ever made. The only thing that I would recommend would be to buy an extra set of balloon bags as they do wear and tear quite easily. Other than that, the Volcano gives me an amazing vaping experience. " "This is a vaporizer for grown ups"
"If you want a vaporizer that actually vaporizers and gives you the ultimate results, this is the vaporizer to get. I bought mine two years ago, I've used it countless times and still do on weekends when I have friends over. The setup process is actually not that difficult. When I first got it, I thought that it would take some time to get the hang of it and learn how to use. Not so. I got the hang of it pretty quickly thanks to a friend of mine who already owned one. I recommend watching Youtube videos on how to use the volcano before buying it. This vaporizer is definitely for grown ups and those who taking vaporizing seriously. 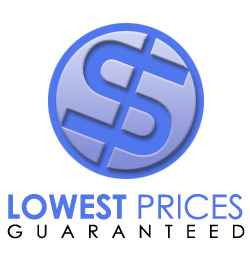 The price is a bit steep but it actually pays for itself in the long run. With the volcano you make much better use of your herb. You'll realize that you get more out of your herb than you do when you smoke it. One balloon filled up with vapor can be enough for one session of 2-3 friends. 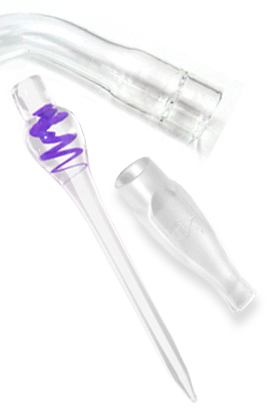 The vapor that it produces is super clean and potent. This is one of the best buys I've ever made. "